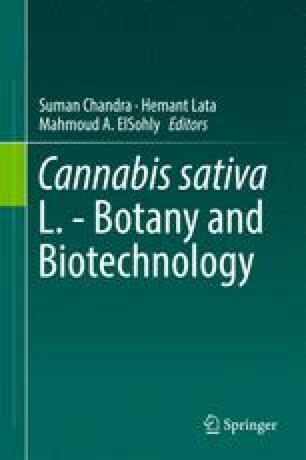 Chemical and Morphological Phenotypes in Breeding of Cannabis sativa L.
This chapter has two parts. The first part details five characters that contribute to phenotypic diversity in Cannabis. Cannabinoids can be assayed by quantity (dry weight percentage of cannabinoids in harvested material) or by quality (the THC/CBD ratio, or chemotype). Cannabinoid quality is largely genetic, possibly monogenic. We dissect the monogenic inheritance model (two alleles at a single gene locus). Essential oil is composed of volatile, aromatic terpenoids. Terpenoid content varies between different varieties. Hemp seed oil consists of polyunsaturated fatty acids, including omega-6 and omega-3 fatty acids, which are under genetic control. Protein has received less attention than oil, despite hemp’s value as a protein supplement. Bast fibers are phloem (sap-conducting) cells in stalks. The second part presents the current breeding status of phenotypes for various uses. Breeding for fiber production includes monoecious cultivars, dioecious cultivars, high percentage of primary fiber, fast-retting phenotypes, and unique morphological markers in low-THC plants. Selective cross-breeding for cannabinoids includes prevalent-THC, prevalent-CBD, and cannabinoid-free plants. Relatively few cultivars have been bred specifically for seed production. This work was supported in part by the European project Multihemp, FP7- Project number 311849.